I have had this idea bouncing around in my head for a while, then, when I saw Jen's specimen art I knew I had to make it a reality! I had already tried glittering some spider rings for a project that FAILED!! I knew it would work but I needed the rest of the supplies. I ran to Michael's and got the exact frames Jen used (they were a steal!). I also had to buy some glitter- Michael's had a pack of about 10 different colors and with a coupon it turned out to be about $4. 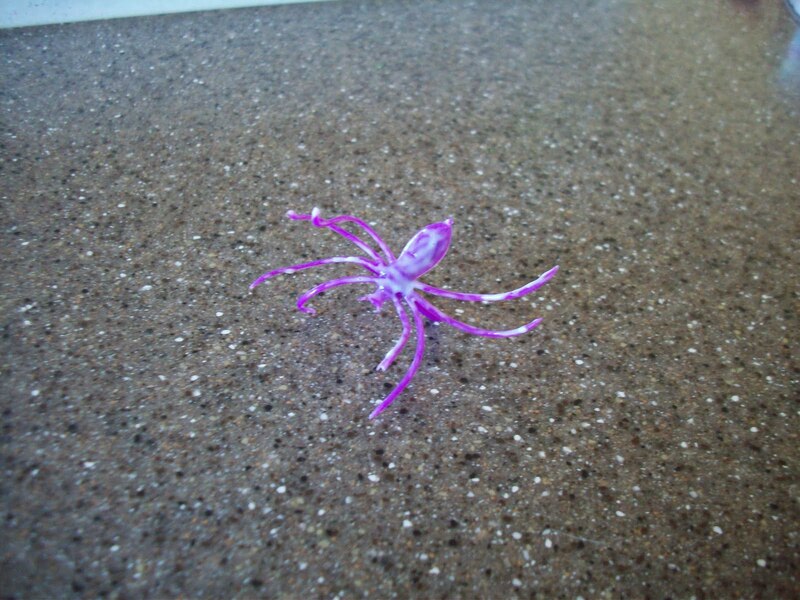 I bought a pack of spider rings at Wal-mart for $2 and I have a TON left over. 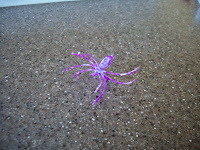 To start I lightly coated the spider with glue on the whole top and the bottom of the legs. I just used Elmer's and it works great. Then I sprinkled it with glitter and let it dry. 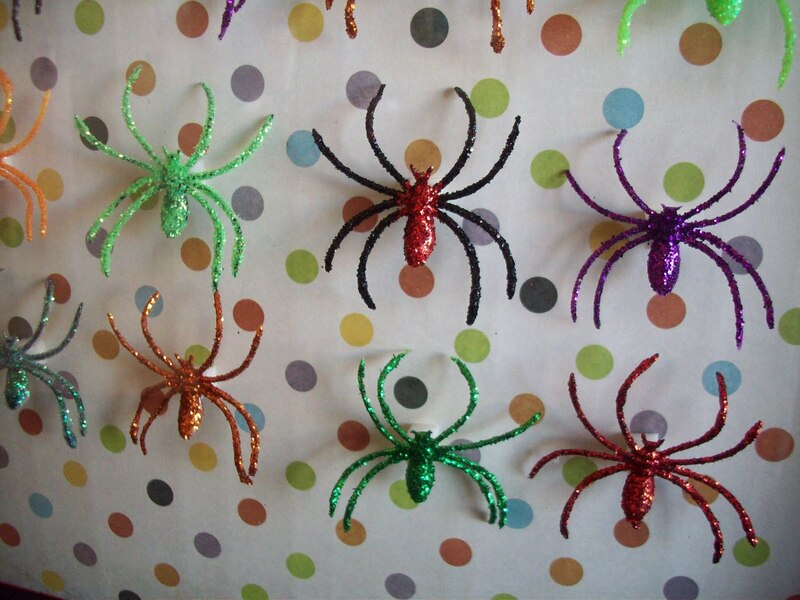 Repeat for all your spiders. When they are dry, I took them outside and gave them a light coat of a clear varnish so the glitter would stay put a little better. After they dry, cut off the ring part. 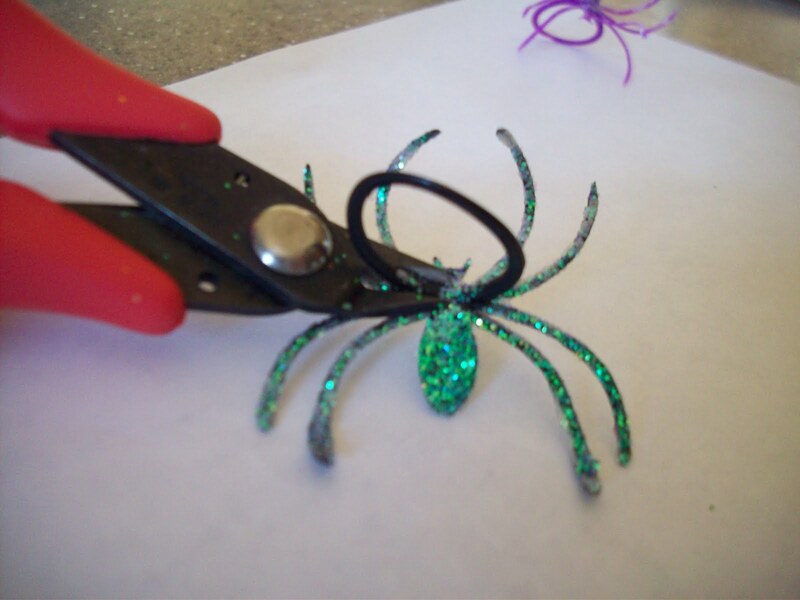 I used these jewelry wire cutters because the angle of the snips let me get in really close to the spider body. 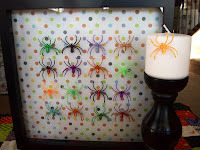 Using foam squares (I doubled them up) I placed the spiders on my scrapbook paper in a grid pattern. Put the frame around it and there you go. I wish I could take better pictures of this, but it's hard to see the glitter and not have reflections in the glass at the same time. I LOVE this project! I love all the colors of spiders, but it would also be great with all black or just black and orange spiders too! *update- my awesome friend and neighbor Chantelle helped me out and took the first two photos! They are much better than what I managed to get. Thanks a Ton Chan! Go check out her other amazing pictures here! Super cute, Amy!! I love how it turned out. That is just too cute! 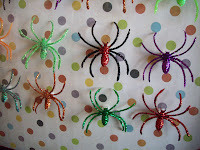 We glittered some spider rings, too, but I haven't done anything with them yet. I might have to copy your idea! Great job! LOVE this spider art. I love the glitter on them - it really makes them look great! That is a wonderful idea! It turned out darling!!! love this!!! actually i love anything with glitter but... this is just fun!! great project. so simple, so classic. very cool. I LOVE this! I am so making one of my own! Thanks for sharing! Hey! Just wanted to let you know that I featured you today on FTF! Thanks for linking, and grab a Featured button if you would like! That's so pretty! I love colorful Halloween decorations. I just clicked over from Tatertots and Jello and would love to link to this if you didn't mind. Thanks so much for linking up to SS!